Dos Vacas Muertas is an eBird hotspot. Located on the west end of Galveston Island, this 6-acre sanctuary was donated to Houston Audubon in 2001 by Dr. and Mrs. George Clayton for use as a bird sanctuary. Open to the public, it contains a pond lined with cane, a small spartina marsh, coastal grassland with cord grass and a woodlot of live oaks. A water drip has been added in front of the two benches. The sanctuary contains flat sandy beach habitat with adjacent wetlands with access to West Bay. Please note that vehicular access to West Bay is not allowed. Directions: Take I-45 South to Galveston's 61st St exit. Turn right onto 61st and proceed to Seawall Blvd. 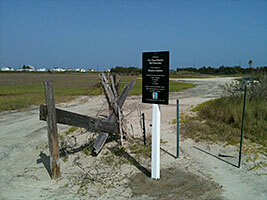 Turn right on Seawall and go approximately 15.6 miles to a dirt road on the right, named "Sea Bird Drive". Sea Bird Drive is before Sea Isle and an outboard motor shop. It is shortly past Sunset Cove Subdivison. Drive down Sea Bird Drive to the sanctuary turnstile entrance. August 8, 2013 Update: Cynthia and Dan Hughes of Galveston helped us out in a big way at Dos Vacas Bird Sanctuary by moving dumped piles of construction waste out of the sanctuary and recycling some of the wood to mount signs to deter future dumping. What a shining example of what makes Houston Audubon special. Thank you Cynthia and Dan Hughes! June 23, 2013 Update: Over the past several months the addition of numerous trees and irrigation have given this sanctuary a needed boost. 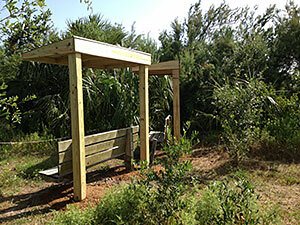 Recently a covered picnic table and shade cover for benches were added. Next on our list is fencing to keep vehicles out of the sanctuary. Thanks to all who are helping with our restoration efforts at Dos Vacas! Special thanks go to Alice Anne O'Donell and Brenda Dawson. The work continues! 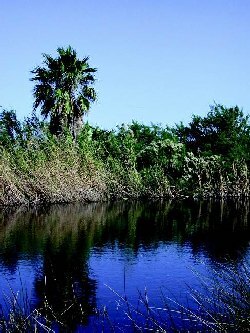 We are seeking funds to restore and protect Dos Vacas Muertas Bird Sanctuary. Contact: Richard Gibbons at rgibbons@houstonaudubon.org.